It can be tricky to keep those unwanted pounds from creeping back on when traveling. When you travel, chances are you’ll be forced to make a sudden shift in your daily routine. Its all too common that this shift means a dramatic increase in calories consumed as you order room service, stave off hunger pangs with airport food, and toss back drinks at hotel bars. Equally problematic is the sizable decrease in exercise while you’re away. Since staying fit means keeping calories in and calories out at equilibrium, its critically important that you maintain a balance between what you eat, and what you do to stay active. So here are some helpful tips to keep you lean when you’re on the road. Take in some sights, and do it on foot. 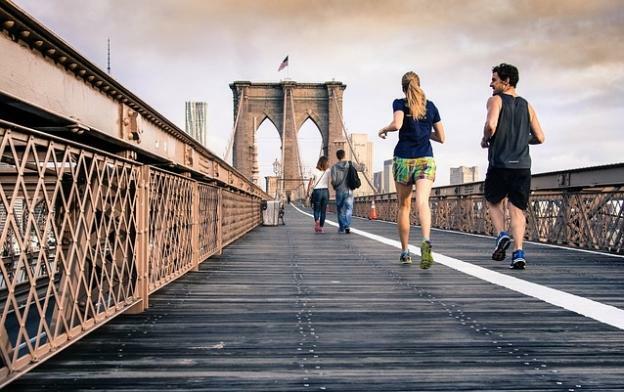 This way you can still burn a good amount of calories just by walking around the city. If it’s a leisure trip where you plan to lounge on the beach, make it a priority to take a long walk along the sand. An hour of walking a day can burn from 180-720 calories, depending on your weight and the speed at which you’re walking. The most important thing is to get those feet moving! If you plan to eat out a lot those calories can sneak up on you! Restaurants use a lot of extra additives to make food taste good, so you’ll want to come back. It’s okay to have a little nibble here and there, but be aware and keep portions at a reasonable level. Opt for a vodka soda instead of a Margarita. Calories saved = 400 per beverage. Try not to eat the whole breadbasket before you meal. Calories saved = 100-400 per meal. 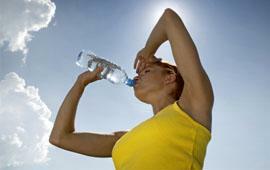 You probably do not think of drinking water as a weight loss mechanism. But it really is. Sometimes you feel hungry when you’re really just thirsty. It’s very common to mistake thirst for hunger, which encourages you to eat much more than you should. Drinking enough water will not only stave off food cravings, it’ll help you to flush out toxins. So drink at least eight, eight ounce glasses of water per day like the doctor says. It can be tricky to make smart choices when afternoon cravings start to kick in. But if you plan ahead you will find it easier to choose healthy snacks. Try packing low sugar protein bars. These quick treats will give you the energy you need to make it to your next meal without crashing. Raw Almonds are always handy to have around. They are a good source of monounsaturated fat, which has been associated with the reduced risk of heart disease. Grab some fruit. If you are staying at a resort with a buffet, a lot of times they will have bananas or apples in the breakfast bar. Grab one on your way out and save it for later. Jump ropes are great because they are lightweight and easy to travel with. They also build cardiovascular endurance and work almost every muscle in the body. If walking doesn’t give you the burst of endorphins you are looking for, then take out a rope and jump for just 15 minutes. That alone can burn 300 calories. Ripley Daniels the author of the “How to stay fit while traveling” is a fitness fanatic and writes online and on the national press on sport subjects and women issues.